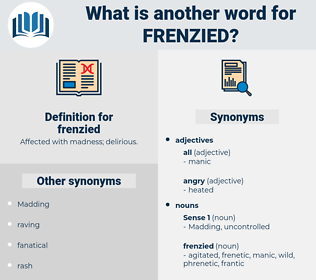 What is another word for frenzied? peaceful, balanced, controlled, pleased, calm, collected, unexcited, happy. 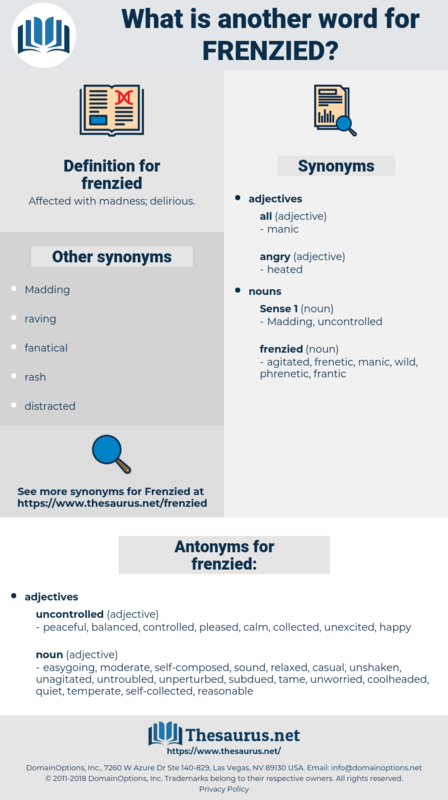 easygoing, moderate, self-composed, sound, relaxed, casual, unshaken, unagitated, untroubled, unperturbed, subdued, tame, unworried, coolheaded, quiet, temperate, self-collected, reasonable. Whether he was frenzied with the lust of battle, riding in the reckless manner that was his wont, confident that his men followed, yet too self - centred to ascertain, or whether - as seems more likely - it was simply that his horse had bolted with him, will never be known until all things are known. But for the alternative he would have made a frenzied dash at the nearest weapon and died fighting.